Music lifestyle store Swee Lee Music Company has a network of seven locations in Singapore, including one within 112 Katong mall (112 East Coast Road). 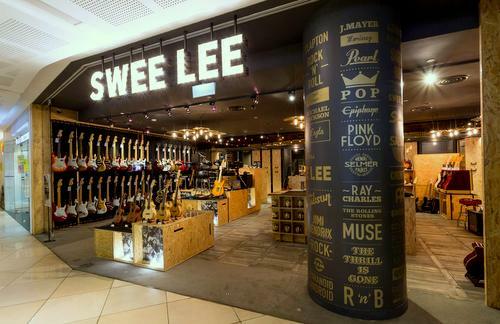 Established in 1946, Swee Lee is a premier destination for musical instruments and pro-audio brands. Today, Swee Lee is synonymous with Southeast Asia’s music and creative culture, and a trusted partner for the world’s best brands. Visiting one of the stores, you’ll be welcomed by the friendly staff, an inviting ambience, and an unrivalled selection of instruments and lifestyle gear. For example, at 112 Katong shopping centre, you’ll discover a broad range of the most current selection of exceptional musical instruments, from Fender, Gibson and Ibanez guitars to the Roland V-Drums, plus a wide selection of strings and accessories are also available. The official Swee Lee Music Facebook page is located at www.facebook.com/sweeleemusic/. You can also follow the official Swee Lee Music Instagram account, which in turn is available at www.instagram.com/sweeleemusic/. …Vandoren, Vic Firth, Voodoo Lab, Walrus Audio, Warwick, Yamaha, ZT Amplifiers, Zvex.